Who Loves to travel: Why do you need a travel Kit? Why do you need a travel Kit? A travel kit is important if you're traveling local or international destination. It is necessary that you're well prepared for something might happen, even that disaster is not welcome during your holiday nor getaways. A travel kit is your collection items that you needed during your travel. It is wise to have your own checklist so you know what are the important things you needed. It might be a simple stuffs from personal stuffs like shampoo, make-up, gadgets, and medications. The most important is you know yourself very well. Like me, I can't leave without my moisturizing and medication. I don't like any disaster or feel sick but am always prepared to bring simple medication for headache, stomachache. Most likely, stores are carrying a travel kit so it is in small size which you can bring it in airplane so you don't to worry about the packaging and sizes. Stress free-by bringing your own travel kit and packed it with all things you needed during your holidays it would lessen your stress if you need some first aid. Come on handy- If you have everything you needed you can do things easily and avoid panic. I always have migraine so my travel kits always includes my meds. It's faster to move with the travel kit with you. 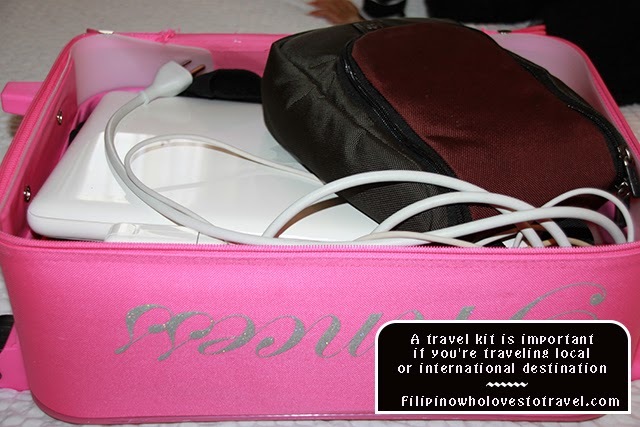 My travel kits has all my toiletress and beauty stuffs in there, also my vitatmins.